Your skip-the-line ticket for New York City’s Museum of Modern Art begins by conveniently purchasing it. Once you have your voucher, simply head to the stunning Museum of Modern Art building in Midtown Manhattan and redeem your voucher. Breeze past the line and venture straight to the exhibits you want to see. Spend time exploring the many rooms of the MoMA, lingering in front of Andy Warhol’s Campbell’s Soup Cans or Pablo Picasso’s Les Demoiselles d'Avignon. There’s no shortage of stimulating works and inspiring exhibits at the MoMA, one of the country’s greatest modern art museums. Continue on to discover works by Frida Kahlo, Salvador Dali, Roy Lichtenstein, Jasper Johns and more. Be surprised at the rotating exhibits, that are always changing. 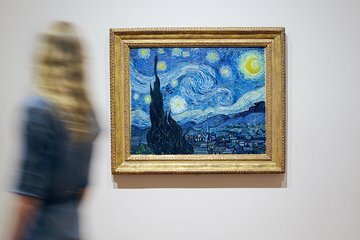 With more than 150,000 works of art inside its walls, as well as 22,000 films and four million film stills, you will never run out of things to see here. Use your time in New York wisely—this is your golden ticket to maximize you precious sightseeing schedule. If you’re still craving more world-class art after visiting the MoMA, use your ticket to explore MoMA PS1, Long Island City’s impressive contemporary art center. MoMA PS1 displays a diverse array of artists, works and perspectives in their beautiful Long Island City location. This ticket is valid for up to 14 days after your MoMA visit. Spent a whole day at MOMA, amazing exhibitions, especially of Calder mobiles, Louise Borgeois work - must see the giant spider, Vincent van Gogh The Starry Night. Decent restaurant for lunch too.